Oh yes. Make no mistake. It's race week. I have absolutely no focus. I'm driving to work this morning, listening to my mojo mix. These are the songs that get me pumped! But wait... why? Why are my eyes welling up? I'm such a gurl. Geez! Why? Why?! WHY?!? I hate the rollercoaster. Here I thought my valleys wouldn't be as low since it's my second time around. Stupid song... talking about not letting your insecurities take hold of you. "You're made for more." "Don't be afaid." Blah, blah, blah. 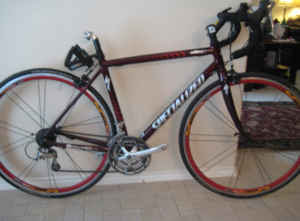 I have to make a quick run to get a new bike mount for my Garmin. I head to my favorite tri store where the parking lot is nuts at lunchtime and I swear the parking spots are made for Mini Coopers. I have an FX35; it isn't big or small.... when people know how to park their vehicles! Ugh!! I had pulled into the spot and realized it just would not do. I was 2/3's of the way in trying to get out without hitting the car next to me. I looked behind me, looked at the car next to me, and in that 1/2 second, someone was behind me! I didn't even see her. I backed into her and my bike rack barely tagged her rental (of course) car. It made a ding, but didn't crack the paint. Thankfully, she was super nice. We exchanged info and kept insurance out of it. She said she'd let me know if they caught it, but "please don't ignore my phone calls." My mind is everywhere else but where it needs to be today. What makes this so bad? I have a backup camera on my car. Can I get an "Oiy!" I was a nut case last week for Oceanside and I was only a volunteer and a family member of an athlete! I think that is always the case when there is a race coming up with me. Good luck this weekend and have a blast!! Looking forward to the race report! !